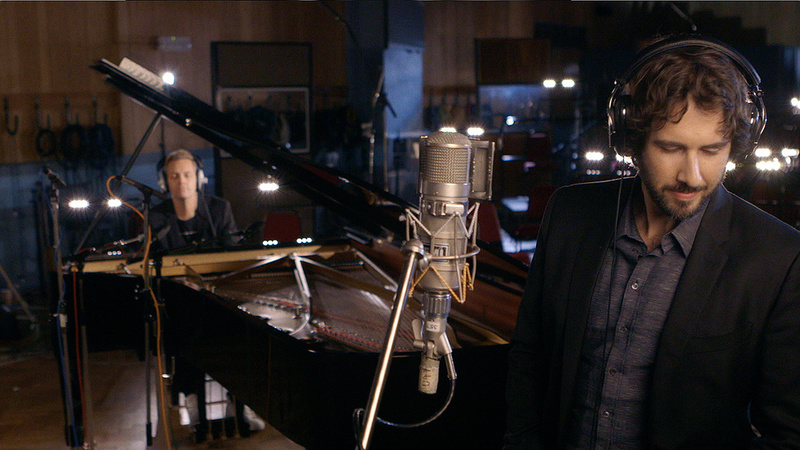 Producer and arranger Bernie Herms (left) and Josh Groban at Abbey Road, where the orchestral parts for Stages were recorded. 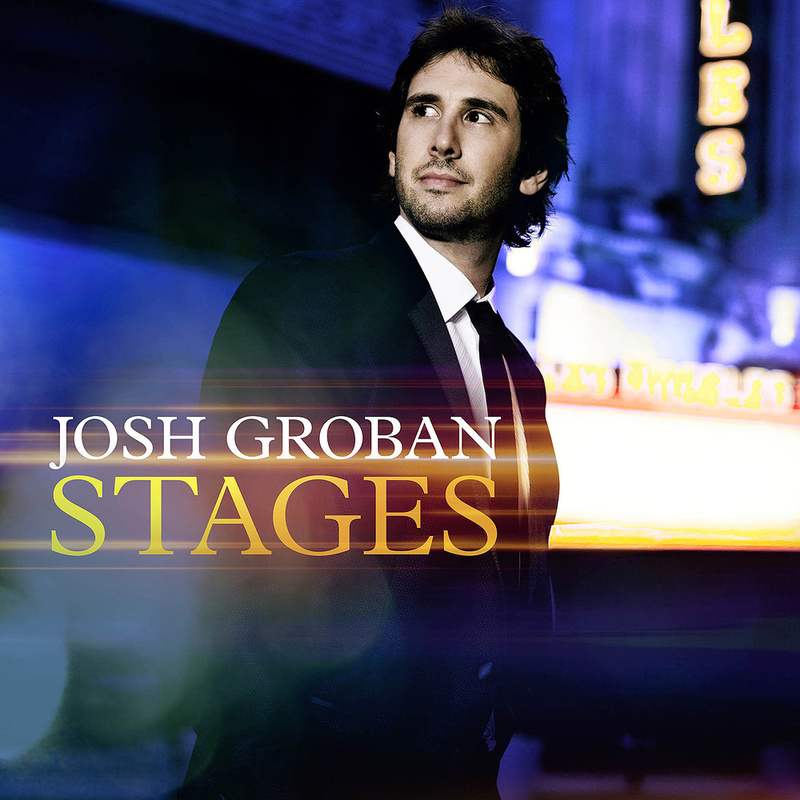 The success of Josh Groban’s album Stages has been out of all proportion to its profile in the media. No-one has even made a Wikipedia page for the album, and it has received few reviews — yet it reached number two in the US, Canada and Australia, and topped the UK album charts. What’s more, unlike many of today’s one-week hits, Stages stayed in the top 20 for some two months after its release in April. The patchy online and press coverage of the Stages album may have something to do with the singer and his audience. Groban is known for his operatic approach to MOR popular music, and Stages features his take on a number of classic Broadway songs from musicals such as Phantom Of The Opera, Les Misérables, The Wizard Of Oz, A Chorus Line and more, for the most part set in big, dramatic, orchestra-heavy arrangements. It is hit-parade material, but not as we generally know it. Stages goes against today’s trends in another important aspect as well. A quick look at the album’s credits reveals that it is an old-fashioned big-budget affair made in multiple large studios — including Abbey Road, where the orchestral recordings took place — and featuring a huge cast of production personnel. Seven of the album’s 15 tracks were recorded, produced and mixed by Humberto Gatica, one of the living legends of the American music industry (see SOS April 2010: www.soundonsound.com/sos/apr10/articles/it_0410.htm), with the assistance of Martin Nessi. The remaining eight tracks were produced and, for the most part, also arranged by the less well-known Bernie Herms, who worked with several different engineers, including his regulars Jorge Vivo and Andy Selby. The latter also mixed three of the album’s tracks. 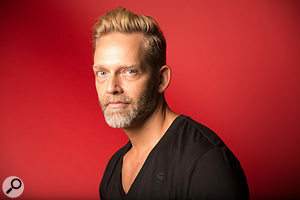 Like the album, Bernie Herms has a minimal online presence, with no web site of his own or extant interviews, yet his Allmusic credits page lists an impressive 593 entries, including names like Barbra Streisand, Andrea Bocelli, Brad Paisley, the Tenors, Ruben Studdard, Casting Crowns, CeCe Winans and his wife Natalie Grant. Strikingly, Herms’ credits see him in many cases acting as musician, composer, programmer, arranger and producer. With a father who was an opera singer, Herms probably thought musical thoughts from the moment he could, well, think. He started playing piano at the age of four and received formal lessons from eight before attending Trinity Western University in British Columbia and completing his studies at Belmont University in Nashville. His goal throughout his career has been to integrate his classical background and his love of popular music. To this end, he bought a Korg M1 workstation keyboard while he was still at high school, and began writing and recording jingles on it. 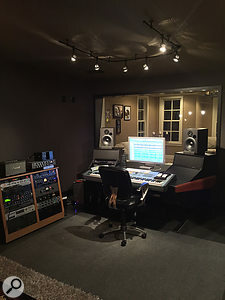 Today he has his own studio in Nashville, called Soulfuel, where he programs and arranges much of the music he produces, mostly using MOTU’s Digital Performer. Integrating both tendencies involves bringing the latest technology to bear on centuries of arranging and composing know-how. 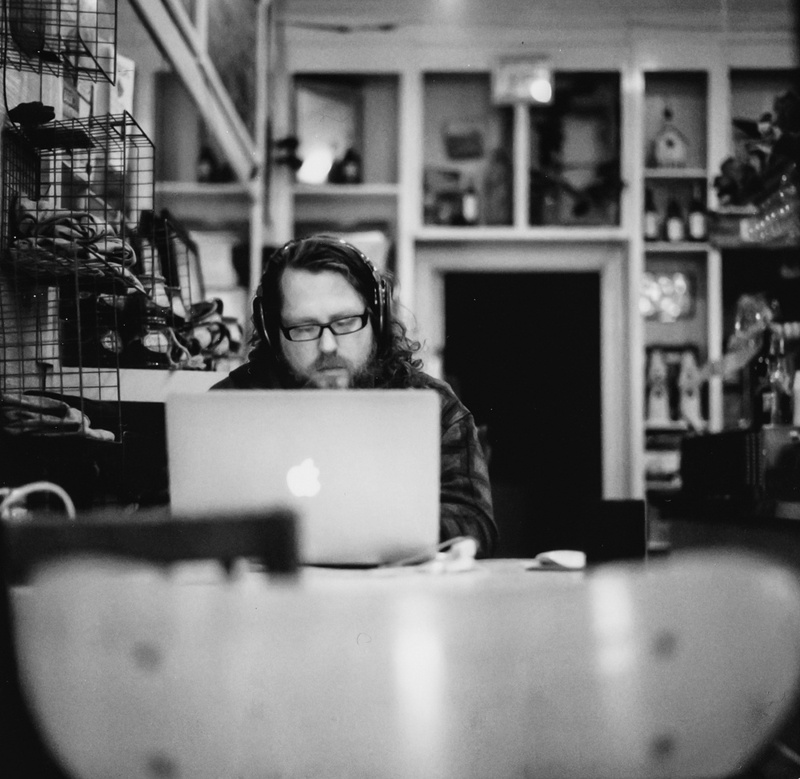 “I used to be a pen-and-paper guy, but today a lot of my stuff exists in the virtual world, in which I do sample mock-ups of my orchestrations that the artist can listen to before we record a real orchestra. Because samples are so amazing today, they allow me to create really inspiring renderings of my orchestrations. They won’t match a real orchestra pound for pound, but they nonetheless are very convincing. So I start there, and then I work with an amazing orchestrator in Nashville called Jim Gray, who scores them for me. Herms’ Soulfuel studio is a typical modern-day affair, with no desk, but the odd bit of outboard, a few good mics, and some decent monitors, plus a bunch of keyboards. The outboard consists of a Retro Sta-Level compressor, API Lunchbox, a couple of BAE 1073 mic pres, Groove Tubes Vipre mic pre, Kenetek 1176N compressor and some other bits and pieces. Herms’ go-to mics for vocals are his Telefunken ELAM 251E or Neumann M269 or U47, and he uses an assortment of other mics for instruments, including Shure KSM44, SM7, SM58 and AKG 451C. His monitors are Event 20/20 BASs and his main keyboard the Yamaha Motif XS8. 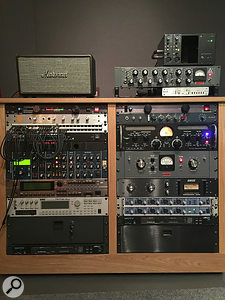 Bernie Herms’ Soulfuel Studio is in many ways typical of modern hybrid studio design, combining computer-based recording and choice outboard gear without a conventional mixing console. 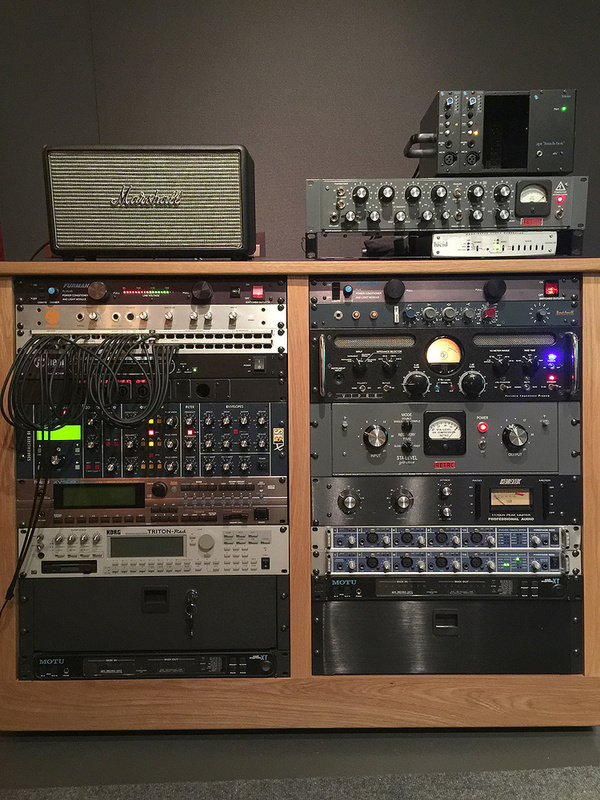 Soulfuel Studios’ outboard racks (left rack from top): Marshall Stanmore aux reference speaker, Dangerous Music Monitor ST monitor controller, Hearback monitor hub, Studio Electronics SE1X, Roland XV5080 and Korg Triton Rack synth modules, MOTU MIDI Express XT interface; (right) API Lunchbox with 512B modules, Retro Powerstrip channel strip, Lucid Genx6 96 clock, BAE 1073 and Groove Tubes ViPre preamps, Retro Sta-Level and Kenetek 1176LN compressors, RME Fireface 800 (x2) and MOTU MIDI Express XT interfaces. It was here that Herms did his prep and arrangement work for the Josh Groban sessions. Here, too, Andy Selby did a significant part of his programming and editing for the eight songs Herms produced, and also part of his mixes of three of these songs. Concurrently Gatica and Nessi were recording tracks for the former’s productions at Capital Studios, United Recording and Sony Scoring Stage in LA. The next stage was for both Gatica and Herms to travel to London for 76-piece orchestral sessions at Abbey Road, following which Gatica and Nessi mixed all but three songs on the album at the former’s Lionshare Studios in LA. One song, ‘What I Did For Love’ (from A Chorus Line), was the odd one out during the entire making of the album. Groban’s management and record company weren’t sure it should even be on the shortlist of songs to be recorded, and Herms came up with an arrangement that contrasted strongly with the other material on the album. It also was the first of three songs that Selby, rather than Gatica and Nessi, ended up mixing. However, the final result was so successful that ‘What I Did For Love’ ended up being chosen as the lead single for the album. 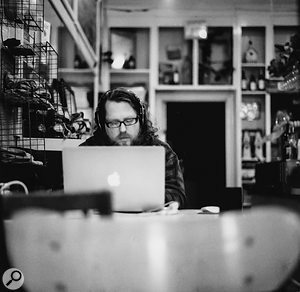 Andy Selby is a musician, engineer, programmer, arranger and mixer who originally hails from California, but has lived in Nashville since 1993. 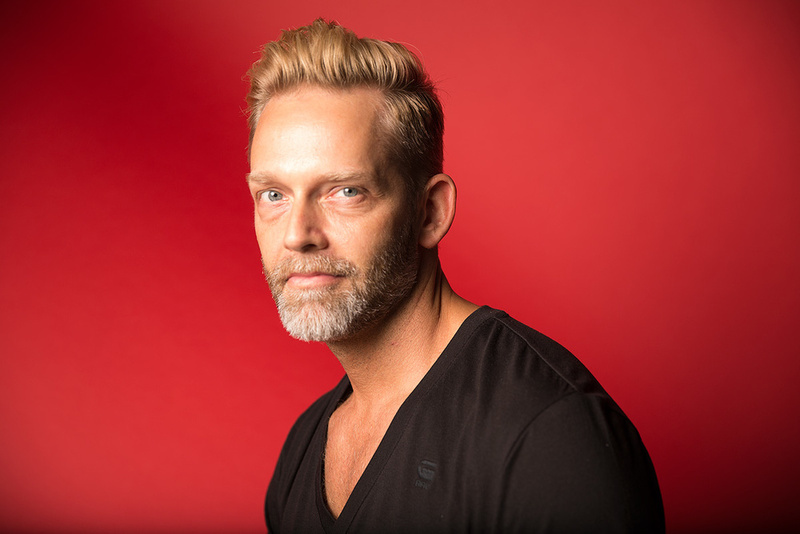 Selby has enjoyed long-term professional relationships with songwriters, arrangers and producers like David Mullen, Tommy Sims, Robert Marvin and Michael Ochs, as well as with Bernie Herms, and his credits include Natalie Grant, the Tenors, Cody Karey and CeCe Winans. He won two Grammy Awards with the latter artist, and received a third Grammy this year in the Contemporary Christian Music Album category for the album Run Wild. Live Free. Love Strong by King & Country. Like Herms, Selby also works in multiple formats, with an emphasis on Digital Performer as his main programming environment (to the point where he’s been instrumental in developing and designing alternative DP ‘skins’: see www.ampguimods.net) “I started out in Digital Performer,” explains Selby, “and still use it because it’s a very musically orientated application, whereas Pro Tools started more from an engineer-audio perspective. Over the years the two have slowly converged, but I have never found one application that does everything I need it to do 100 percent of the time. Digital Performer has incredible pitch control for vocal editing, and Melodyne is actually based on what DP did with its pitch engine. Yet Melodyne still doesn’t do everything DP can, which is why I use both of them together. Also, the way DP’s interface is laid out is great. It has these two screens that allow you to instantly switch between a bird’s-eye view and a zoomed-in view. With most modern DAWs you’re constantly toggling the zoom. Much of Andy Selby’s editing, programming and mixing work can be carried out on headphones, so he prefers the mobility of a laptop rig to the overheads of a fixed studio.Selby’s rough mix of ‘What I Did For Love’ had such an impact that he was given the job of finishing it for the final release. However, both Selby and Herms emphasise that the mix had been shaped during the entire production process, when Selby was continuously busy editing and shaping the material Herms had recorded. 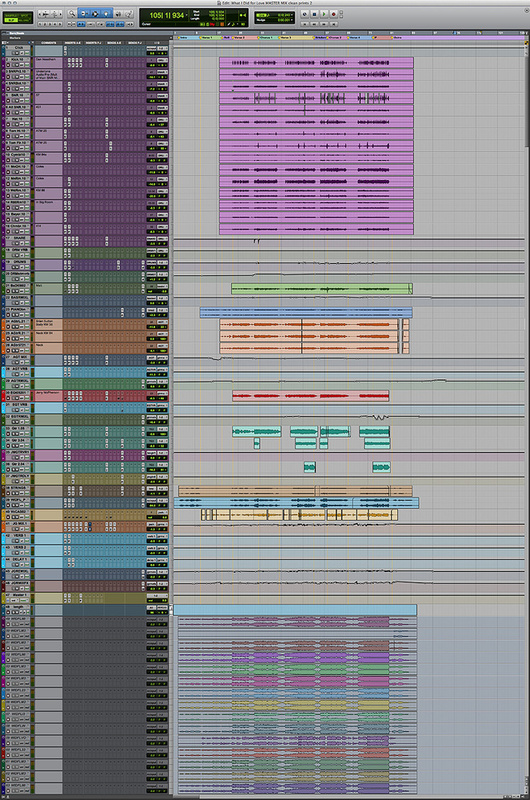 Selby’s Pro Tools mix session for ‘What I Did For Love’ is very tidy and transparent. Beneath the click track there are 17 drum tracks (plus four related auxiliaries), single bass and piano tracks, three acoustic and four electric guitar tracks, a strings stem track and a string sample stem track, a lead vocal audio track (plus no fewer than five related aux tracks), and finally a master track. Below that are stem mix tracks. Justin Niebank’s hands clearly are all over the audio tracks, as the comment boxes detail each player, and many of the microphones that Niebank used. 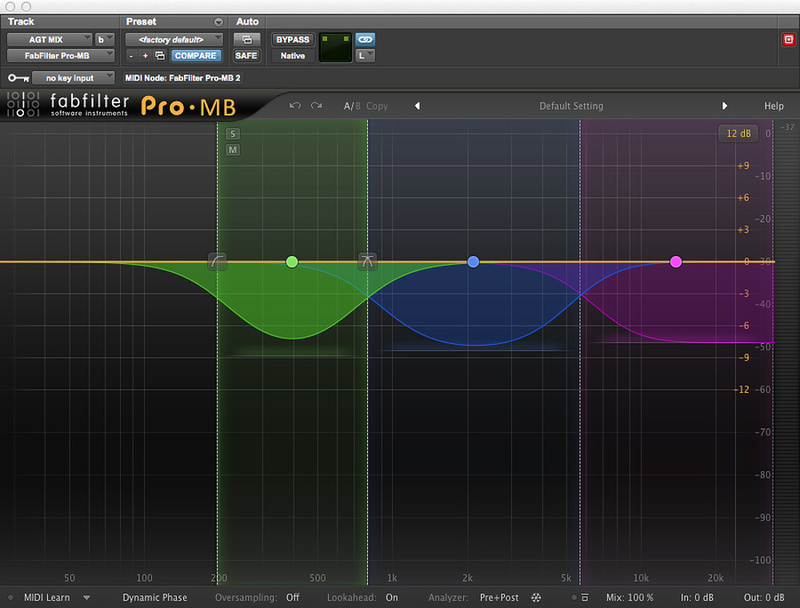 Andy Selby is a big fan of FabFilter’s plug-ins, including the Pro-MB multi-band dynamics processor, used here on acoustic guitar. 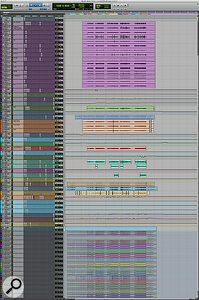 This composite screen capture shows the entire Pro Tools session for ‘What I Did For Love’. “In this session the kick has the SoundToys EchoBoy, my favourite delay, and then three instances of the Pro-Q 2. I keep on putting layers of EQ, and only pull back when it goes somewhere I don’t want it to go. I have the Q2 on each of the three snare mics, the hi-hat, the cymbals, and the room mics, while the ‘E’ on the toms is the Pro Tools Expander/Gate. 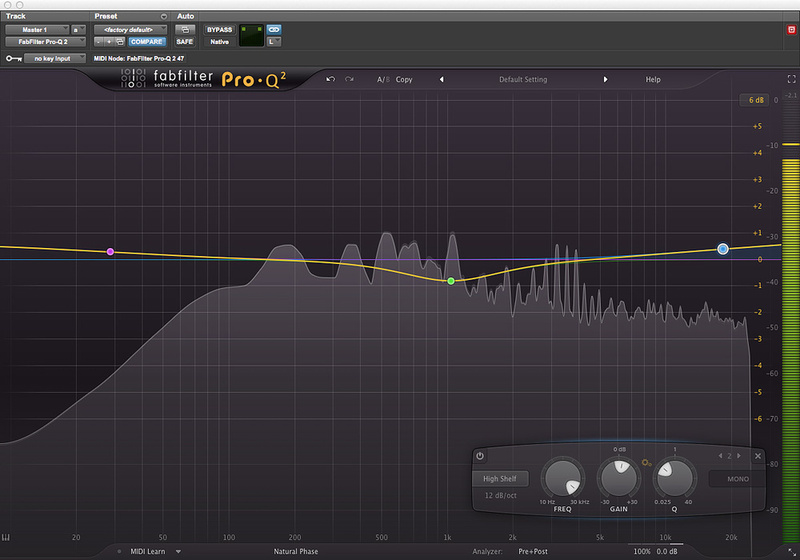 I have the [Audio Ease] Altiverb on the drums as a whole, and again an EQ. I always EQ my effects; it’s part of what sets my mixes apart. Track 20 is an aux track for the bass with the Altiverb and Q2, which comes from an earlier version. I’ll sometimes bring it back in and will ride the level. 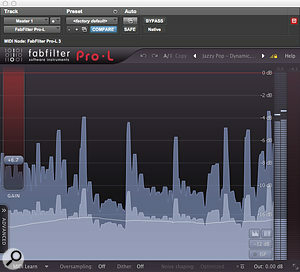 “The bass track, 22, again has the Q2 and other FabFilter plug-ins. 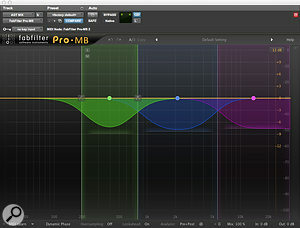 The three acoustic guitar tracks, 24-26, go to submix track, 27, with the Q2 and Pro-MB and other FabFilter plug-ins, and then a reverb aux with, again, the Altiverb. The electric guitar also has the Q2 and the ‘T’ is just a trim. The electric guitar reverb comes from the Valhalla Vintage Verb, which I adore. The Valhalla Shimmer also is great, it’s like the Brian Eno sound in one plug-in, though I did not use it in this mix. There are again several instances of the Pro-Q 2 on the electric guitar, while ‘7’ is the Waves CLA 1176, which is my all-time favourite compressor. It has such a cool sound! “The strings are stemmed down from a much larger session, of course. We also pushed up some of Bernie’s programmed strings in places for some emphasis. Track 40 are Josh’s lead vocals, and I always have these running to a mono aux, track 41, where I do all the processing, so I won’t have to disable all the plug-ins when I edit the actual vocal audio track. The vocal chain on that aux track is the Waves CLA Vocal plug-in, just pushing things in the upper mid-range and brightening things up, then there’s the Q2, then the Pro-MB, then the CLA 1176 and finally the FabFilter de-esser. ‘T’ is just a trim. Tracks 42 and 43 are again the Altiverb with the Q2 EQ, and 43 is an aux with an EchoBoy delay. 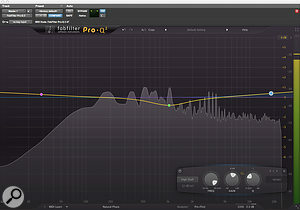 “Finally, track 47 is the master track, with a Q2 and the Pro-L limiter. The latter has really changed the sound I can get out of the box. It makes things bigger and wider and warmer than any other limiter I have heard. It is wonderful. It creates a sound stage that is just enormous, and so was particularly suited to this mix. Bernie and I put in a lot of time and emotion into this mix. Including the rough mix it was a process that took us weeks!” FabFilter’s Pro-Q 2 equaliser and Pro-L limiter were used across the master bus. Judging by Stages’ significant chart success, as well as the few reviews of the album that can be found on the Internet, the time put in by Gatica, Nessi, Herms and Selby was exceptionally fruitful. As some reviewers have it, the album is an “exquisite reality of sound, emotion and joy”, while ‘What I Did For Love’ is characterised as “a listening experience that makes one smile”. Bernie Herms produced eight of the album’s 15 songs.